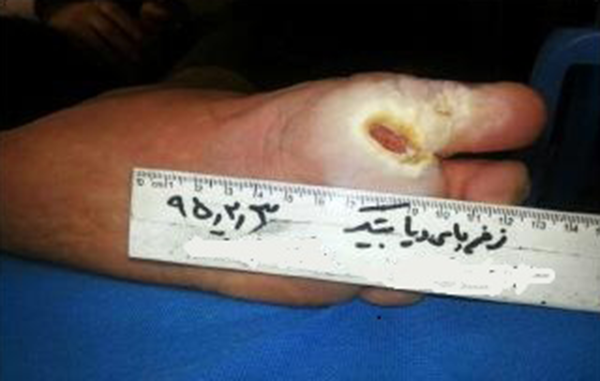 To Cite: Hajimohammad K, Esmaili R, Rahimi Z. Maggot Debridement Therapy for Diabetic Foot Ulcer: A Case Report, Crit Care Nurs J. 2017 ; 10(3):e9836. doi: 10.5812/ccn.9836. Introduction: Diabetic foot problems account for more hospital admissions than any other long term complications of diabetes and are responsible for nearly 50% of all-diabetes-related hospital bed days. Maggot debridement therapy (MDT) offers important advantages for the management of chronic and infected wounds and is used in hundreds of clinics worldwide. This study aimed to evaluate the benefit of maggot debridement therapy (MDT) in the treatment of a patient with a diabetic foot ulcer (DFU). Case Presentation: A 46-year-old male patient with a 6-year-old diabetic foot wound in the right leg. Maggot larvae were placed on the wound. The patient was followed for 6 weeks and luckily had a good response to treatment. Conclusions: This study concluded that MDT is as powerful as traditional debridement in the treatment of diabetic foot ulcers. It would be an achievable different option for diabetic foot ulcer treatment. In conclusion, we observed that MDT could promote wound healing by increasing endothelial proliferation, triggering angiogenesis, and maggot excretion/secretion, which might facilitate this process. Diabetes mellitus (DM) is one of the most prevalent diseases that affected more than 371 million people worldwide in 2012. By 2030, this number is expected to rise to 552 million (1). Of all diabetic complications, diabetic foot ulcer (DFU) is one of the most devastating and costly syndromes. DFS is defined as any necrosis, gangrene, or full-thickness skin defect occurring distal to the ankle in a diabetic patient (2). The lifetime risk of developing a foot ulcer in a patient with diabetes can be as high as 25% (3), and the incidence of lower extremity amputations has been reported to be 46.9600 per 100,000 patient-years (4). The healing process is impaired in diabetes, which is a result of several intrinsic factors (neuropathy, vascular problems, other complicating systemic effects due to diabetes) and extrinsic factors (wound infection, callus formation, and excessive pressure at the site) (5). Therefore, the main aims of DFU therapy include antibacterial actions and supplementation of growth factors and cytokines, leading to stimulation of granulation, epimerization, and angiogenesis (6). - The importance of doing a thorough assessment on all patients, but particularly known diabetics and their feet. - The likelihood of 'being the one' to discover a diabetic foot ulcer, or the early signs of one, are very good. - That neuropathy, vascular changes, and immunity impairment are only a few of the ramifications of hyperglycemia. - The primary goal would be the prevention or reversal of diabetes. - The patient being unable or unwilling to meet that goal must be educated on the importance of glucose control and good foot care for the prevention of diabetic foot ulcers (12). One of the ‘old’ techniques in wound care is maggot debridement therapy (MDT). MDT is also known a maggot therapy, bio debridement, or larval therapy. In MDT, live and medical grade fly larvae are applied to the patient’s wounds to achieve debridement, disinfection, and ultimately wound healing (13). For 70 years, maggot therapy has been recognized as an aid in debridement and wound healing (14). Medicinal maggots secrete digestive enzymes that selectively dissolve necrotic tissue (15), disinfect the wound (5, 7), and stimulate wound healing. During the 1930s, maggot debridement therapy (MDT) was routinely used in hundreds of hospitals around the world for treating bone and soft-tissue infections (16). With the introduction of antibiotics and other improvements in wound care, by the 1960s, maggot therapy was used only as salvage therapy for the most serious wounds. Over the past few years, there has been resurgence in the use of maggot therapy (10), even though its optimal role has not been clearly defined. Maggot debridement therapy (MDT) has been used for centuries and in many different cultures. After witnessing the benefits of maggot-infested wounds in the battlefields of World War I, the orthopedic surgeon William Baer successfully applied maggots to children with severe osteomyelitis (17). By 1934, more than 1,000 surgeons were using maggot therapy, the surgical maggot were available commercially from Lederle Corporation (18). MDT is indicated for open wounds and ulcers that contain gangrenous or necrotic tissues with or without infection (19). It was reported that larvae and their secretions have antibacterial effects, reduce inflammation as well as neo-angiogenesis, and improve wound healing. This form of therapy will be of great help in a situation where the cost of treatment is costly to the patient and/or the conventional treatment is not working. However, before it finds its rightful place in the treatment of diabetic ulcers, there is need for it to be accepted by health professionals involved, especially at the treatment dispensation phase like the nurses (20). 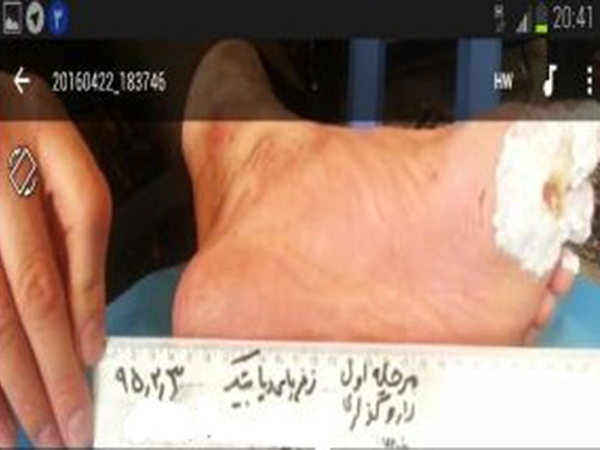 In this study a case report of Maggot therapy on diabetic foot ulcers will be discussed. A 46-year-old male patient with a 6-year-old diabetic foot wound in his right leg with a history of diabetes that is treated with the glibenclamide and metformin tablets. 6-year-old diabetic foot wound in the right leg straight and debridement in patients with hospital admissions have not been getting the right result. Metformin 500 mg 3 times a day and glibenclamide 5 mg 3 times daily have been used. Metformin tablet 500 mg 3 times a day and glibenclamide tablet 5 mg 3 times daily have been used. During this period the patient is referred to a specialist orthopedic infection and amputation is proposed. The average fasting blood sugar is 250 to 400. Hb A1C:14. After Doppler ultrasonography and ensuring the health of blood vessels and the adequacy of the blood supply to organ, treatment was started. At the beginning of treatment, a diabetic foot ulcer in his right leg was sick, completely infectious, and gangrene (Figure 1). Maggot larvae were placed on the wound. Maggot removal of the lesion was performed in 2 stages. Bakewell active and Hydrutk was the dressing that was used. Complete healing of the ulcer treatment lasted 20 days. The stage of the treatment is shown in the Figures 2 - 7. 1. Wound fully closed by second intervention (for example split skin graft). 2. Wound spontaneous fully closed. 3. Wound free from infection and less than one-third that of original wound size. 4. Clean wound (free from infection/necrosis/slough), but same as initial size. The Azad et al. study suggests that larval therapy has several advantages such as rapid wound debridement, infection elimination, pain control, and ulcer healing (14). The higher number of patients actually achieving complete wound closure within the 8-week study period (14% with maggot therapy vs. 0% with conventional therapy) did not reach statistical significance. The use of larval therapy has the potential to reduce side effects and decrease the need for amputation. It is obvious that with the increasing prevalence of diabetes and its complications, there is undeniable need to train nurse specialist in this field. 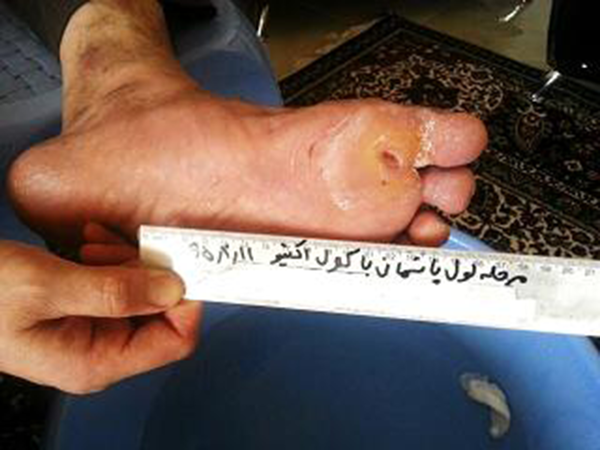 The diabetic foot is so important to such an extent that it was considered as one of the main objectives of the healthy people 2010 to reduce the incidence of foot ulceration and amputation in diabetic patients. Therefore, it was targeted a 55% reduction in amputations and an increase of nearly 75% in diabetic foot examinations. This study concluded that MDT is as powerful as traditional debridement in the treatment of diabetic foot ulcers. It would be an achievable different option for diabetic foot ulcer treatment. In conclusion, we observed that MDT could promote wound healing by increasing endothelial proliferation, triggering angiogenesis, and maggot excretion/secretion, which might facilitate this process.